The men’s basketball team defeated defending champion American, 65-63, at Kirby Sports Center this evening to win the Patriot League Championship and earn an automatic bid to the NCAA Tournament. 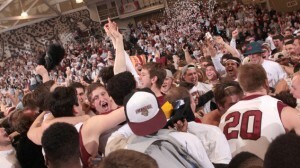 The Leopards will discover their NCAA Tournament fate on the Selection Show 6 p.m. Sunday on CBS. A viewing party at Kirby Sports Center with coaches and players will be open to the public, with doors opening at 5:30. The show will be displayed on the video board at the arena. The Leopards were led on offense by Nick Lindner ’17 with 25 points and Seth Hinrichs ’15 with 16. Lindner was named Tournament MVP during the trophy ceremony following the game. Dan Trist ’15 and Hinrichs were also selected from Lafayette as All-Tournament Team selections. Lafayette set Patriot League Tournament records in field-goal percentage (60.1%, 86 for 143) and three-pointers made (30) and its 64.9 percent from the floor Wednesday was the highest ever in a championship game. The Leopards went 24 for 37 from the floor, 8 for 15 from three (53.3%) and 9 for 11 from the foul line (81.8%). The fourth-seeded Leopards (20-12) became the lowest seed to win the league tournament title in its 25-year history. Lafayette got off to a slow start, but clawed back to take its first lead at 17-15 on a triple by Lindner as part of a 9-0 run. 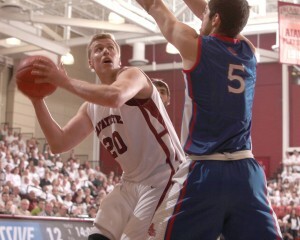 American closed to 23-21 before the Leopards reeled off five straight points, capped by a Hinrichs three-pointer. The Leopards put the clamps on the Eagles offense, forcing a shot-clock violation with less then three minutes to go in the first half. 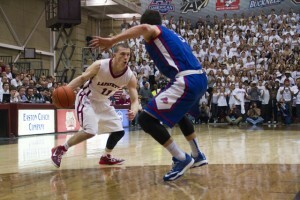 A Lindner three-pointer pushed the lead to 30-21 before American’s Mark Vasic matched him. Lindner scored on a layup and made two free throws on the next possession to give Lafayette a 34-25 halftime lead. Back-to-back three-pointers by Bryce Scott ’16 and Michael Hoffman ’17 gave Lafayette its biggest lead of the game at 40-27. But the Eagles scored seven straight points to close the margin with 15:42 left in the game. After a Lindner jumper ended the run with a bucket, Hinrichs scored the next six points for Lafayette, sandwiching two runners around a mid-range jumper to push the lead to 48-36. A three-point play on a fast break layup followed by another layup from John Schoof cut Lafayette’s lead to 50-47 with less than 10 minutes left. A Linder three-pointer with the shot clock running down electrified the crowd and put the Leopards up by six, but Pee Wee Gardner answered with his own three-pointer. He followed that up with a layup to cut the lead to 53-52. American then took its first lead of the second half on a three-point play by Marko Vasic at 5:07. Hinrichs redeemed himself for his foul on that play by retaking the lead for Lafayette on a three-pointer. A three-pointer by Zach Rufer ’16 pushed the lead to 59-55 with 2:16 remaining. After two Eagles free throws and a Lafayette timeout, Trist made a layup with the shot clock running down. A Gardner three-pointer cut it to 61-60 with just over a minute remaining. Lindner then made a bucket while being fouled, but missed the free throw. Rufer corraled a very tough rebound off a missed Schoof three-pointer and was fouled to give Lafayette the ball with 13.7 seconds left. Following a foul by Gardner, Lindner converted both ends of a 1-and-1, giving Lafayette a 65-60 lead with 14.5 seconds to go. Hinrichs rebounded a miss by Schoof with 4.6 seconds remaining and missed the 1-and-1. Reese made a 3-pointer just before time expired. The victory brought Lafayette’s record to 10-0 in home Patriot League Tournament games and gave the Leopards a measure of revenge after falling to the Eagles twice in the regular season. Lafayette advanced to the final by beating top-seeded Bucknell in the league semifinals at Sojka Pavilion in Lewisburg, Pa. Bucknell was the first top seed in league history to get knocked out of the tournament before reaching the championship game. A moment of silence was observed before the opening tip to honor two Maroon Club Hall of Fame quarterbacks who passed away earlier this week, Joe Bozik ’58 and Tom Kirchhoff ’93. Go Lafayette! I’ll be rooting!